Watch as I play the latest DLC for Rise of the Tomb Raider. In Cold Darkness Awakened, Lara must save the valley from a violent toxin that transforms men into blood-thirsty beasts! She must destroy the weapons research facility before its too late! This is a very interesting predicament we find Lara in. The gameplay is fun, challenging, and just plain scary! Thankfully, there's a "Groovy" card that morphs your flashlight into a psychedelic rainbow. 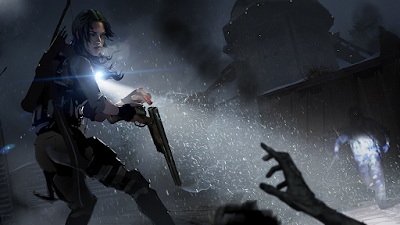 The DLC pack includes 15 new Expedition Cards, the Voidhammer Shotgun, and the Ushanka outfit, which reduces damage Lara receives from melee attacks. Check out the new concept art below and read the developer's blog HERE. Cold Darkness Awakened is available now on Xbox One, Xbox 360, and PC.